These simple guidelines on leash training your puppy will have your pup walking on a loose leash in no time at all and you'll be enjoying pleasant, stress-free walks much sooner than you think! When you're out for a walk with your dog, there's nothing worse than having your arm pulled out of its socket by an over-enthusiastic puppy who won't walk nicely on a loose lead. Just imagine what that's going to be like when he's fully grown! Taking your dog for a walk should be enjoyable for you both. 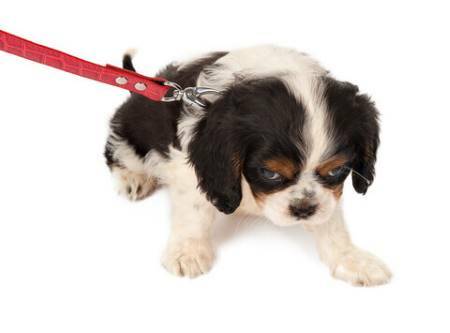 Puppy walking shouldn't involve pulling, dragging, or yanking the lead to get him back in line. Nor should it involve your puppy zig-zagging across your path, causing you to trip over him or his leash! Puppy walking should be a tranquil, enjoyable experience for you both with a few stops and sniffs (for him) thrown in along the way. Because it's more difficult to leash train a dog (who's had plenty of time to learn many bad habits) leash training is best done as early as possible. Get it right in the early days, and you and your puppy will have hours of gentle, relaxed walks to look forward to! 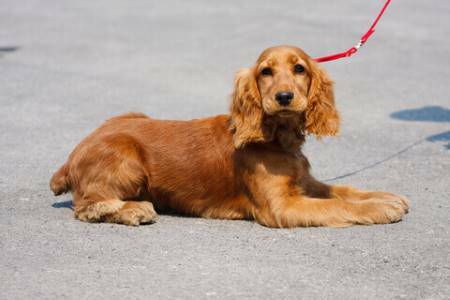 Follow the simple steps outlined below, take things slowly and methodically, and you'll soon have your Cocker Spaniel puppy walking nicely on a loose leash by your side. Don't expect to be able to put a collar and lead on your puppy and then have him walking quietly by your side. If you do, you're going to be disappointed; that's not going to happen! 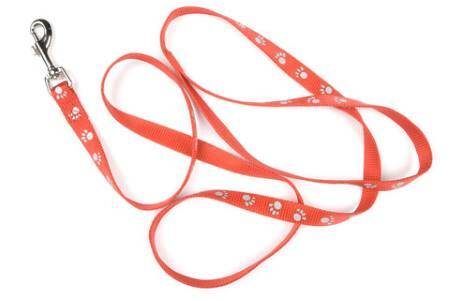 Before you can begin leash training you will need to introduce your puppy to his new collar, which should be a thin, lightweight collar specially designed for puppies. Show it to him first, let him sniff it, tell him he's a good boy and then give him a small treat. Put another treat down on the floor and as he goes to take it, (while he's distracted) place his collar around his neck and fasten it so that it's loose enough for you to slide two fingers underneath. Let him get used to the feel of it around his neck, but don't add the leash yet. He may scratch at his neck a few times or he may try to remove it by rubbing his neck along the sofa or the floor. Important Note: Never leave a young puppy wearing a collar unsupervised. Accidents can and do happen - enough said! If that happens, distract him with a treat or his favorite toy and play with him for a while. It won't be too long before he forgets he's wearing a collar! Don't be tempted to remove the collar while he's 'protesting' because this will only lead him to believe that if he makes a fuss each time, you'll remove it. Only remove his collar when he's calm. Spend a couple of days putting his collar on and taking it off again so that he's completely at ease with it. When you reach this stage, he'll be ready to try out his new leash! Just like with his collar, you will need to introduce your Cocker puppy to his new lead. Because he's so young, you only need a thin lightweight puppy leash, nothing too heavy. Something like the lead in the photo to the right will be fine. Clip it onto his collar whilst he's distracted, perhaps while he's feeding or playing. Let him wander around, dragging the leash behind him, but keep a watchful eye on him to make he doesn't snag it on anything. What To Do If Your Puppy Tries To Run Away From His Leash! If your puppy tries to 'run away' from his lead, turn it into a game. Simply clap your hands and run in the opposite direction. Your puppy will look toward you to find out what the noise was, see you running away and will happily chase after you (completely forgetting about his leash!). Your puppy may try to chew the lead. If this happens, try distracting him with a treat or a toy, as in the above leash training exercise. If that doesn't work, you might like to try using one of the bitter sprays to make his lead taste unpleasant. That might do the trick. Either way, it won't be too long before he gets used to wearing his lead and will forget about it, especially if he's got a chew bone or his favorite toy to play with. Most puppies follow their owners around the house, (all day long!) but this may change when he's wearing his new collar and lead and isn't yet used to it. If he simply sits there and looks at you, and he won't come when you call him, try bribing him into following you by showing him his feeding bowl (with a sprinkling of kibble in the bottom) and then walk backwards, holding the bowl out in front of you so that he can see it. If he's still not interested, try doing this exercise when his little tummy's empty. Walk around the kitchen, food bowl in hand, and just watch how eagerly he follows you. Food is a great motivator when you're hungry! Reward your puppy with lots of praise and treats from his food bowl and it will help to get the message across that he's getting it right; following you is what you want from him! Practice this two or three times each day for a couple of days. Try it in different areas of the house and don't forget the garden too! By now he's used to wearing his collar and lead and you're ready to pick up his leash and take him on a short walk. Ask a friend to hold his leash while you place a handful of treats on the floor at the other side of the room. If you're alone, tie his lead to a chair while you do this to stop him following you. Return to your puppy and take hold of the end of his leash. Keep it short, but slack. Begin walking him slowly toward the treats. Your puppy will probably pull on the lead, eager to get at them. If this is the case (and I can almost guarantee it will be!) stop walking and say, 'Oh oh', 'No' or 'Don't pull' (you choose the words) and return to your starting position before trying again. Do do this each time he pulls and it won't be long before your puppy learns that if he strains on his lead, he won't get any nearer to the treats. If your puppy reaches the treats without pulling, don't let him take them from the floor. Instead, ask him to 'sit' while you pick them up and THEN give him one or two as a reward, and lots of praise of course. It's important to continue practicing this exercise until your puppy walks without pulling on his leash several times in a row, without fail, and in different areas of your home. You're now ready to try this outside! If your puppy is not yet fully vaccinated, you should be able to walk him safely in your yard or garden, so long as it's secure and not visited by other un-vaccinated dogs. If you've worked him hard enough indoors, he should happily walk outdoors with you, without pulling, but don't expect him to behave as well as he did indoors because there will always be exciting new things that may distract him. When leash training, always be patient and don't forget to praise your pup when he gets it right. Once he's mastered walking loosely on his lead, it's okay to continue giving him an occasional treat but gradually remove them otherwise you may end up with an overweight puppy. Keep the training sharp and short. Repeat each exercise several times each day until he's really mastered it before moving onto the next step. If your puppy simply isn't playing ball, try tiring him out first before doing any of the above exercises. This will help to keep his attention focused on you and not on his surroundings. You may get more results that way. If your puppy doesn't show any interest in his kibble, try using high value treats instead such as hotdog, cooked chicken, liver, or cheese - just make sure they're cut up into very small pieces. Max will do anything for a piece of liver! When you're dog leash training (or any training for that matter) you don't always need to use treats as his reward, you could use his favorite toy if he's motivated enough by it. But if you do use treats, always offset them against his meals and as he becomes more accomplished, reduce the amount of times you use treats as a reward. I hope this has helped you to teach your Cocker Spaniel to walk nicely on a loose lead and has given your puppy leash manners to be proud of!